Cows in a slaughter house (Image credit: awionline.org). People say animals don’t exist for us to eat, to test medicines on, or to otherwise use, and they’re right, but are we going to stop? I saw a video where newly hatched chicks were separated by gender, and the males, who don’t grow to be as big, were simply ground up – I was horrified. Most of us aren’t going to stop eating meat, even after seeing that. Some of us will, but not most, most of us will simply stop eating meat from THAT producer and buy from someone else. But, there is a simple, cheap, and easy way to slaughter animals: helium. That’s right, you read that correctly. Ever inhale the helium from a balloon? Sure, we all have. But ever take a second breath without any air? If you did I bet you never took a third. I was a little kid when I did it because I didn’t understand what would happen. On my second breath of helium I fell to the ground nearly passed out. It didn’t hurt, I wasn’t scared, I simply went limp and dropped – no pain and no headache after. How much would it cost really? Three or four breaths of helium, per chicken, per goat, or per cow would be what, a penny’s worth of gas maybe? 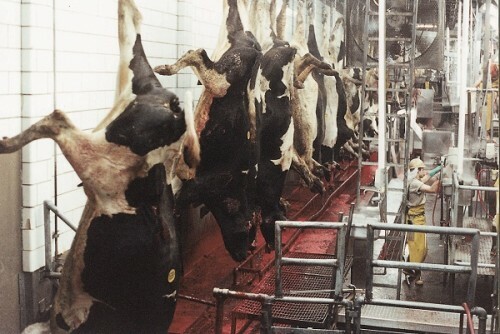 After they’re unconscious it doesn’t matter how they’re slaughtered – they won’t feel a thing. It’s not much, it doesn’t make the tiny cages any better, but at least we can show a tiny bit more humanity. THIS is something we CAN do. It requires little money and little extra equipment – it’s a minor change that will make a big difference. We’re not expected to be heroes, but we all do whatever we can. If someone’s about to be hit by a car we yank them out of the way. And why wouldn’t you? Write to your local chapter of PETA, write to your local slaughterhouses, write to your local representatives in government and help make this happen. And let’s put labels on the products: HUMANELY SLAUGHTERED. By David A. Lindsay, Author of “Lost from Atlantis – Book 1” and “Death by Murder,” soon to be released on Amazon Kindle. Follow him on Facebook by joining the “DavidALindsay.com” and “Lost from Atlantis” groups. It is common sense and logic , in order to be animal rights activist, somebody must be vegetarian…have some joke : again Japanese whalers and Greenpeace ships met somewhere in Southern Ocean : Japanese ship displayed banner : SAVE THE PIGS, KILL THE WHALES…Greenpeace ship responded with banner as well : SAVE THE WALES, KILL THE PIGS…..who is right ? who is wrong ?